David Menasche was a teacher for 15 years in Miami. He was diagnosed with brain cancer the day before Thanksgiving, 2006. However, it wasn’t until July 15, 2012 when he suffered an episode (still not sure if it was a seizure or a stroke) that his life was completely changed. Since then he’s become mostly blind and paralyzed on the left-side of his body. But his sense of humor and positivity haven’t been affected by the 3 surgeries, 30+ chemo treatments, and more. He’s most famous as the author of The Priority List, his book on his most famous lesson, his diagnosis, and his journey. His personality is certainly largely than life, and with reason. Given only months to live in 2006, he’s still defying his diagnosis 8 years later. (Here’s also an article from The Today Show on Menasche). Jake Miller, The Educator’s Room: How did your brain cancer diagnosis turn into a story? David Menasche: I was crushed because I realized in 2012 I couldn’t be an effective teacher anymore. Soon I found myself sitting at home every day, bored like the dog waiting for my then-wife. So one day I just decided to do some traveling. I asked people on Facebook if they wouldn’t mind hosting me, and within 3 hours I had 50 offers from former students and friends. Some 75 couches, and 100+ people later, I documented my travels and then converted that narrative into a book. JM: I remember in The Priority List (link to purchase the book) that your brother mispronounced your first name (Da-VEED instead of David) to mess with you. But how do you pronounce your name? DM: It goes like this – Muh-NASH-ay. No joke involved there! JM: I read that you took videos and have more sources from your Vision Quest. Are they private or public? DM: You can access them on YouTube. The videos are a mix of those the students created, while others are my own. You can also visit our Facebook page and find plenty of pictures there, too. JM: What one single story stands out most from your Vision Quest travels? DM: When in was in New Jersey visiting my friend Steve, I held his new baby, who was just 4 days old. Freshly squeezed. He and his wife have 2 adopted children, and one of the days while visiting there, this newborn, who was the blood sibling of one of their adopted children, was dropped off at their door step by social services. I have never held anything so fragile and so small. This trip was about doing things I’d never done and always should have done. Holding that child certainly tops that list. A close second would be finally making it to the West Coast. While there I saw the Pacific Ocean. I met a former student who now has her PhD, published a book, married with a great husband, and soon they will welcome a baby of their own. JM: How difficult was it to turn your Vision Question into a book? DM: Well, the original manuscript was rejected. The publisher wanted me to rewrite in a much shorter and narrative version. That’s not what I intended, but that’s what I did. I poured out my heart-and-soul twice. Like all art, it has to involve pain – or it’s not honest. JM: What has life been like since you wrote The Priority List? DM: Other than the whole blind and crippled thing, I can’t complain. Like the old joke, “Other than that, how was the play, Mrs. Lincoln?” I try to have a sense of humor about it all. JM: Has your Priority List changed? DM: Ironically, my number 1 is a word not on original list of 26 words. My first priority is strength – the ability to endure. I want people to know that being disabled is an honor, and I’m living to have an honorable life and death is important, but strength is more important. JM: I understand the concept of the priority list and love how you’ve presented it to students through Othello, but how exactly does it work? DM: Students – or any reader – need to organize all 26 abstract words in order from greatest to least important. The words are things like spirituality, artistic expression, family, friends, fun, and travel. All 26 words are in the book. The readers then need to decide not only how important they are, but are they practicing what they preach. For example, if career is number 25 on the list but you’re always working, you need to set your priorities straight. JM: I also remember from the book that tattoos became a form of self-expression since your battle with cancer. How many tattoos do you have? DM: I have one tattoo with many spaces in between. DM: I have 8 tattoos in all. My most recent tattoo is “the dead man’s hand” on my right forearm, with a text “Be Brave” below it. My favorite tattoo is says “I DECIDE” below the collar of my neck. JM: Weren’t these adding to the pain of your chemo, surgeries, etc.? JM: Have you ever read the book or seen the video for Randy Pausch’s The Last Lecture? DM: Yes, I’ve read and watched both. His work is incredible. But his message is different than mine. His is a good bye and leaving final advice for the people he feels he needs to be speaking to. I have no intention of dying. I’m going for immortality, and – so far so good. I’m not saying goodbye. I’m saying join me. Get off your damn couch and make use of this time you’ve been given. JM: Hollywood is buzzing with your story, most especially because Steve Carrell has signed on to play you as the lead. What are your thoughts on that? DM: To be honest, I have very mixed feelings. I love Steve Carrell and the production company. They are all going to do a wonderful job. On the other hand, I have plenty of anxiety. More people will see this movie than know me and read the book combined. The fact is, much of my legacy will be based upon this movie. This screen writer will be writing his script based upon his impression of my book. The actor will then base his perception of my character based upon the script. I fear this becoming like the telephone game, with my “character” being passed from me, to my book, to the script, to the actor, and then to the public. I’m afraid that the message may be lost in translation. I won’t be in any hurry to see the movie, hoping I make it that long. But I have to say that I’m excited. I hope it encourages people to read the book. JM: A colleague and good friend of mine just was diagnosed with a brain tumor. So far she’s been very positive about it – even naming it (“Barney”). Do you have any words of wisdom for her? DM: First of all, I’m sorry to hear that. But it seems like she’s doing the right thing in giving it a name and staying positive. I’ve learned that humor is the easiest thing to lose and the hardest to go without – you need to credit Nancy Mairs for that quote. I’ve been reading a lot of her stuff “on being a cripple.” Can your friend still read? DM: Well, if she ever can’t, tell her The Priority List is also on Audiobook, so I can it to her if she’d like. JM: [Laughs] You’re something else, man! DM: I can help her in any way, too. Seriously, whatever she needs. Or anybody for that matter. If there can be good coming out of all this s*** that I’ve gone through, it makes it all worthwhile. JM: Have you already been helping others? DM: I serve as an Ambassador for Voices Against Brain Cancer. It’s a great organization. Please share the link with others so they can support it and learn more about it, too. JM: What’s one tip you have for teachers who are struggling with their own personal issues? DM: Give me a shout on Facebook. It doesn’t matter what ails people / teachers / kids: A person who has a “why” to live for can always figure out a “how” – and you need to credit Nietzsche on that one. My classes and students were always my “why.” Now I feel compelled to serving a purpose and getting a sense of fulfillment by helping others. Whatever the issue, find a reason to live, and then everything else will come. It can be children, art, faith, your career, friends, or a hobby. It doesn’t matter. Knowing that you can get through whatever because you have purpose makes it worth it. If this bald, mostly blind, half-limp guy can do it, there’s a “way” for anybody. 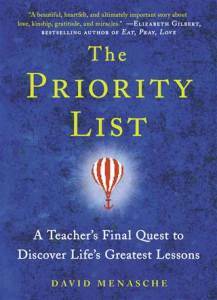 Purchase David Menasche’s The Priority List here.